Injection moulding is one of the most common manufacturing methods to produce thin-wall engineered parts. Development of moulds that produce high quality parts is a talent that develops with experience. Due to the time and effort required to develop a good set of tooling, it is not unusual for manufacturers to seek out injection moulding machines that will be compatible with their moulds, rather than trying to redesign moulds to work on specific machines. As designers of injection moulded products you are probably well aware of design best practice. What you may not appreciate is the important contribution a well designed mould tool can make to the new product development process. The wrong decisions taken at the critical early stage of a project will add cost and time to mould tool design, manufacture and maintenance, put pressure on product launch dates, and, of course, adversely affect product manufacture and in-use performance. 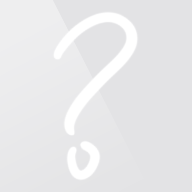 1) Have you specified a material and grade before the mould tool is designed? YES. Well done! Go to wall thickness. NO. You are in trouble already! 2) Walls cool at different rates depending on thickness; have you taken this into account when designing your part, particularly at the junctions between thick and thin sections? YES. Congratulations! Go to draft angles. NO. Your part will suffer from sink and warpage unless you have designed-in ribs. 3) Have you added one degree draft on all non-textured walls, ribs, bosses and any other feature created in the line of tool opening? YES. Good job! Follow the link to the next question about draft angles. NO. The tool will need special parts, adding cost. 3) Have you added at least three degrees to all shut out faces (places where tool surfaces touch), for example, part openings? YES. Keep up the good work! Go to the final question about draft angles. NO. Tool wear will increase significantly, driving up maintenance costs and reducing tool life. 4) If your part is textured, have you increased draft angles accordingly? YES. Give yourself a pat on the back! Go to ribs. 5) Are the ribs that you have specified for strength – to avoid warpage and/or to add functionality – no more than 50% of the thickness of the walls with which they mate? YES. How good is that! One more question on ribs. NO. Your part will suffer from sink and warpage. 6) Are the ribs you have designed very thin or deep? NO. Smashing! Go to bosses. YES. This will add time and cost to tool production. 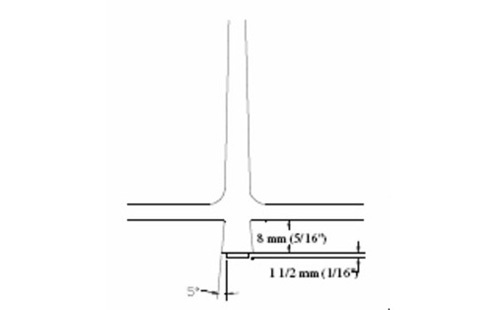 7) If you need bosses for screw fixings, have you specified a one degree draft angle and is the section no more than 50% of the thickness of the wall with which it mates? YES. Way to go! Go to clips. NO. The tool will need special parts, adding cost, and your part will suffer from sink. 8) If internal undercuts are required for fixing and location features, or because part geometry is the same in both sides of the mould tool, have you confirmed that the cores will move away from the undercut as the part is ejected? YES. Magic! Go to external undercuts. NO. The tool will not operate. 9) To produce the external undercuts required for holes and openings, or dictated by geometry of the total part, have you confirmed that the cores will operate as the tool opens? YES. Cool! Go to split/parting lines. NO. The part will get trapped. 1. Follows a smooth path? 2. Can vent gases created during moulding? 3. Avoids cosmetic and functional faces? YES. Have three pats on the back! Go to part ejection. 11) The selection of an ejector type depends on part geometry and features such as bosses; have you considered how your part will be ejected from the mould? YES. Brilliant! Go to feeding. NO. Insufficient ejection risks the part distorting or suffering from stress marking. To ensure optimum filling, have you specified the location and type of feed gate before the mould tool is designed? YES. One more to go! Go to cooling. NO. Parts of the mould will not be sufficiently filled, causing sink and warpage. 12) To ensure optimum processing of the material, mould temperature must be correctly controlled; have you considered how the mould can be heated and cooled? …are caused when a wall section is either too thick or there is a sudden change in section, typically where ribs and bosses are placed internally or where the extremity of the part is the same section or larger than the area where the feed is occurring. Cosmetic appearance is affected and dimensional accuracy will be lost. In extreme cases there will be a void inside the part potentially leading to mechanical failure. Some materials are more susceptible to sink than others with polypropylene and polyamide the worst culprits. …like sink is caused when the section is either too thick or there is a sudden change in section and there is insufficient strength in the part to hold the required shape. Appearance and dimensional accuracy are affected. All materials will warp but polypropylene and polyamide perform particularly badly. A uniform mould temperature means that the temperature of each half of the mould is the same (within ±3°C (5°F)) for all locations when the mould is heated by oil or steam. moulds that are heated with electric cartridge heaters can vary by as much as 6°C (10°F). A mould with a uniform temperature will fill easier and produce parts with less warpage, improved dimensional stability and a uniform surface appearance. Achieving a uniform mould temperature is dependent on your method of mould heating. A mould that is heated by steam or oil will have a uniform mould temperature because the heat source maintains a constant temperature. However, oil, as a heat source, is only about half as efficient as steam. Therefore, when using oil to heat a mould, it is necessary to set the oil temperature higher than the desired mould temperature. Electrically heated moulds are more difficult to maintain at a uniform temperature because the cartridge heaters are constantly cycling on and off. When they are on, they generate a great deal of heat at the source, but this heat must be distributed throughout the mould in a way that produces a uniform mould temperature. To determine the amount of wattage needed to heat a mould, the use of the following formula might be helpful: 1¼ kilowatts for every 45 kg (100 pounds) of mould steel. Note: This formula normally will allow the mould to be heated to moulding temperatures in 1 to 2 hours. Locating a heater on the centerline of the mould is not recommended, because the center of the mould is normally hot enough without adding any additional heat. Typically, the cartridge heaters are located in the support plates with a distance of 64 mm (2 ½”) between heaters. NOTE: Deep draw moulds may need to also have heaters in the retainer plate. There should be a minimum of one thermocouple to control each half of the mould. In larger moulds, it is recommended to have more than one thermocouple in each mould half. This will result in better control and more uniform mould temperatures. 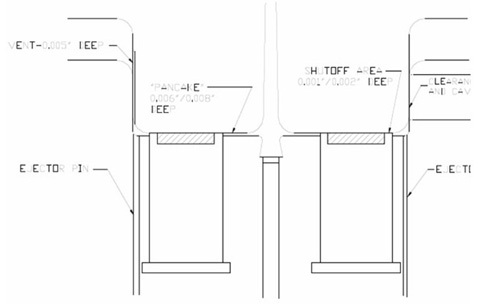 The thermocouples should be located in the “A” and “B” plates, between two heaters if possible and at a distance of 32 mm – 38 mm (1¼” – 1½”) from the closest cartridge heater. This distance is to be measured from the edge of thermocouple hole to the edge of the cartridge heater hole. The distance from the thermocouple to the heater is important because a heater that is too close will cause the thermocouple to turn off the heat before the mould is at temperature. A heater that is too far away from the thermocouple will result in a mould that overheats and then gets too cool. Likewise, it is not a good practice to position a thermocouple so it senses the external surface temperature of the mould. If possible, it should be located 38 mm – 51 mm (1½” – 2″) inside the mould, since the temperature taken there, is less susceptible to outside influences and therefore more stable. When injection moulding with multiple cavity moulds, it is important that all the cavities are filled simultaneously. The most common means to achieve a balanced fill is to make the distance the material travels from the sprue to each cavity the same. This approach will work as long as the material flows directly from the sprue to the gate of the part. However, if the runner is divided two or three times in going from the sprue to the gate, it is unlikely that the fill will be balanced. An effective way of balancing the fill is to have one main runner that extends from the last cavity on one end of the mould to the last cavity on the opposite end, with sub-runners feeding the individual cavities. To balance the fill of the cavities, flow resistor pins are placed in the sub runners. These pins are adjusted to inhibit the flow of material to the individual cavities so all the cavities are filled at the same time. 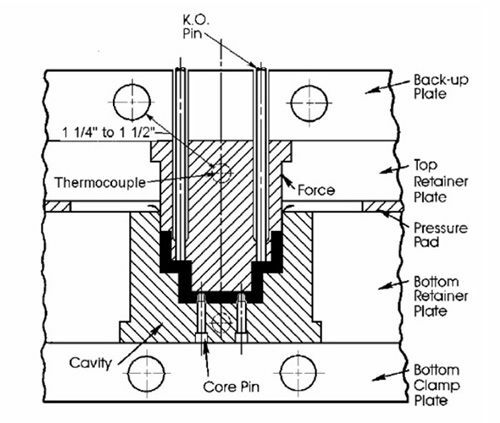 When moulding thermosets, the polymerization process that takes place produces volatiles, which along with the air already within the cavity chamber, can become trapped and superheat to 375°C – 425°C (700°F – 800°F). If the gases are not allowed to escape through vents, they may oxidize the lubricants leaving burn marks on the part. The vents allow the volatiles to escape to atmosphere. In addition to visual problems, improper venting will result in parts that cannot be filled, have dimensional problems or have less than the expected physical and/or electrical strengths. The first question that has to be addressed is vent location. It is important that all vents must lead to the atmosphere otherwise the vent will be useless. Unless the part geometry shows some obvious locations for vents, a brief moulding trial should be conducted to observe where the gas voids occur. Whenever possible, vents should be located in the movable half of the mould, wherever a gas void or knit line is seen on a part. Vents for phenolic parts should be 6 mm (¼”) wide and 0.08 mm – 0.09 mm (0.003″ – 0.0035″) deep and vents for polyester parts should be 6 mm (¼”) wide and 0.05 mm – 0.06 mm (0.002″ – 0.0025″) deep. The width is not as critical as the depth. A vent that is 0.025 mm (0.001″) or less, is too shallow and may seal when the mould is closed. A vent that is 0.13 mm (0.005″) is normally too deep and may not seal. As a result, internal cavity pressure will be low and the shrinkage, the physical and the electrical properties may not match data sheet values. Of equal importance to the location and depth of the vents is vent length, which is the distance from the part that the vent maintains its 0.08 mm (0.003″) depth. The vent should be approximately 25 mm (1″) long to allow pressure to build in the cavity after the material in the vent cures. After this point, the vent can be relieved to a depth of 0.25 mm – 0.50 mm (0.01″ – 0.02″). To help the vent stay with the part, the corner of the vent at the part edge can be radiuses or chamfered. It is sometimes necessary to vent “dead” areas of the mould with vented ejector pins. Before adding the vents, an ejector pin should fit the hole in which it will operate within 0.025 mm (0.001″). A flat is then ground on the diameter no deeper than 0.13 mm (0.005″) for a distance that will take the vent 3 mm (_”) below the fit length of the pin. Normally, the fit length should be 13 mm – 16 mm (½” – _”) . (See sketch below) In addition, the stroke of the ejectors should be long enough for the entire vent plus 3 mm (_”) to come up above the bottom of the cavity. This is so the vent can be self-cleaning or so an operator can blow the flash off the pins. Something that is often overlooked in venting is the polish. It is recommended that all vents be draw polished in the direction of flow to at least the same finish as the cavities and cores. They should be polished for their entire length including the relieved distance. If a mould is to be chrome plated, all the moulding surfaces should be polished and plated including the vents. The orifice of the sprue bushing must always be larger than the I.D. of the nozzle of the press. Normally, the sprue bushing should have an orifice that is 0.8 mm (1/32″) larger than the press nozzle orifice. This difference in diameters helps the sprue pull out of the nozzle and the stationary half of the mould. The spherical radius of the nozzle should match the spherical radius of the sprue bushing. Alignment of the nozzle and sprue bushing can be checked by, pinching a piece of paper between them. Care should obviously be taken to not injure ones self or anyone else when conducting this check. In addition to checking the alignment, this same check will tell if the nozzle and sprue bushing are fitting together tightly or if they are damaged and causing leakage. We suggest that the new moulds start out with a sprue bushing orifice of 6 mm (7/32″) Dia. with a corresponding nozzle orifice of 5 mm (3/16″) Dia. These diameters are considered fairly small for thermoset materials and forcing the material through these diameters, should produce frictional heat in the material that can help to reduce the overall cycle times. Many times the largest cross section in the mould is found at the base of the sprue bushing. By changing from a typical 7 mm (9/32″) Dia. Sprue bushing orifice to the smaller 6 mm (7/32″) Dia. Orifice the diameter at the base of the sprue bushing will also be reduced 1.5 mm (1/16″). A small change like this can sometimes result in a cycle time reduction. Sometimes, for no apparent reason, you will have a significant number of nozzle freeze ups. A possible cause is too much heat being transferred from the mould to the nozzle. With a 165°C (330°F) mould and a 110°C (230°F) nozzle, the natural tendency will be for the mould to heat the nozzle. One way to reduce the heat transfer is to use a nozzle with a 12.7 mm (½”) spherical radius nozzle with a sprue bushing that has a 19 mm (¾”) spherical radius. This reduces the surface area of contact between the nozzle and the mould. Water cooled sprues can be used to eliminate the scrap, if you are moulding polyester. However, if moulding phenolic or melamine-phenolic parts, using water cooled sprue may result in frequent nozzle freeze ups. Sprue bushings typically are only hardened to 43-45 HRC. The runners, cores and cavities of a typical mould for thermoset materials are hardened to a minimum of 52-54 HRC. Because the sprue bushings are relatively soft, they wear out fairly quickly and a worn sprue bushing can cause sprues to stick in the stationary mould half. To improve the wear resistance of sprue bushings used in moulds for thermoset materials, we suggest using sprue bushings made out of D-2 steel. These sprue bushings can be hardened to 62 HRC and they will also have higher chrome content than conventional sprue bushings. Both of these qualities should improve the wear resistance and the release properties of the sprue bushing. In order to insure that the sprue comes out of the sprue bushing and stays with the runner, a sprue puller is used. As can be seen in the sketch, a 5° reverse taper on the puller that starts at the runner and extend 8 mm (5/16″) below the runner is recommended. In addition, a small radius (approximately 1.5 mm (1/16″)) at the junction of the puller and the runner and a larger radius (approximately 6 mm (¼”)) at the junction of the sprue and the runner is used to help hold the sprue, runner and sprue puller together. The added step on the bottom of the sprue puller is an aid to the removal of the sprue and sprue puller. Standard locating rings provide no support for the center of the mould. In some cases it may be necessary to have support in the middle of the stationary side of the mould. (i.e. heavy flashing in the center of the mould.) Stationary side support can be accomplished by switching to the modified locating ring shown below. This type design allows the center of the stationary side to be “domed”, by placing shims under the locator ring. When designing runners for moulds, there are a number of possible approaches. These include the standard full round with a centerline. This is the most efficient runner, but in some cases it is necessary for the runner to be in only one half of the mould. A standard trapezoid runner is often used in situations that require the runner to be only in one mould half. 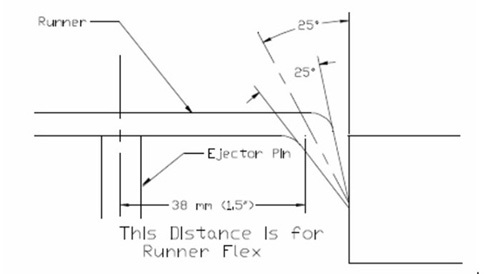 The effective runner size is shown in the figure to the left. The four corners become “dead” areas with nearly no material movement. To reduce the amount of scrap in the runner, a modified trapezoid runner design is suggested. This design reduces the dead areas without a significant change to the effectiveness of the runner. The tip of the gate breaking off and sticking in the mould. This is especially true for polyester moulding materials and therefore, the use of subgates in moulds for polyester parts is not recommended. The amount of steel at the parting line above the gate being too thin which results in the metal wearing away very quickly after the mould begins to produce parts.To reduce the likelihood of the gate tip breaking off and sticking in the mould, the tunnel needs to be well polished so all EDM pits are removed. Locating an ejector pin at least 38 mm (1½”) from the tunnel allows the runner to flex and pull the gate out of the mould without breaking. It is also important to design the tunnel so the angle of incidence with the part allows the gate to pull, but keeps sufficient thickness of steel at the parting line to prevent breakage. See the sketch for further clarification. Recent developments in thermoset injection moulding have shown that a part can be moulded with nearly all signs of the gate gone. This is done using a gate cutter. A gate cutter is a blade or a pin that is located in the mould directly below the gate. Immediately after the material is injected into the cavity, this blade is advanced forward to seal off the gate. Once the lade is in the forward position, the material cures against it, producing the same finish as the rest of the part. The only visible trace of a gate is a witness line. In nearly all moulds, the use of inserted cavities and cores is encouraged. The primary reason for this is in the event of an individual cavity or core being damage, that particular cavity can be removed from the mould and repaired while the rest of the mould is put back into service. Having individual cavities also allows for insert changes that make it possible to run multiple versions of the same basic part simultaneously. When the parts are very small and there are a large number of cavities, individual cavity inserts might not be feasible. In those situations, we would suggest using cavity inserts of 3 or 4 cavities. The materials most commonly used for cavity inserts are H-13 and S-7. Both of these materials will harden to Rockwell 52 to 54 HRC and can be polished to produce an excellent surface finish on the parts. Once the location of the ejector pins is determined, the pin size needs to be decided upon. Very small diameter ejector pins can be problematic because of their susceptibility to breaking. Therefore, ejector pins smaller in diameter than 2.4 mm (3/32″) are not recommended. Another common problem is material flowing down around the ejector pin and jamming it so it breaks when the ejectors are actuated. To prevent this from happening, the hole for the pin should only be 0.025 mm (0.001″) larger than the pin for a depth of 13 mm – 16 mm (½” – _”) from the cavity. Making it deeper can result in the pin binding and breaking. To ensure that the ejector plate moves along the centerline of the ejector pins, it is suggested that the mould be equipped with a guided ejector system. In addition to aligning the ejectors, the guided ejector system moves the load of the ejector plate and the retainer plate from the ejector pins to the guide pins and bushings of the ejector system. While aligning the ejector holes in the mould with those in the retainer plate is always important, with a guided ejector system the alignment is even more critical. While it is desirable to have the ejector pins located on flat surfaces, this is not always possible. It is sometimes necessary to locate ejector pins on contoured surfaces. Ejector pins located on contoured surfaces should be made to match the contour of the cavity. It will be necessary to key these pins so they will maintain their alignment with the contour of the cavity. Sometimes parts may want to stay in the stationary mould half or a mould designer will install a stationary side ejector system as a precaution. For a compression or transfer mould this is not a problem. However, adding an ejection system to the stationary half of an injection mould can be complicated, since it will add 76.2mm – 101.6mm (3” – 4”) to the height of the mould. Therefore the amount of press daylight will need to be reviewed to make sure the mould can be opened and the parts ejected. This added length will not only increase the amount of scrap, but due to the larger sprue diameter at the parting line, the cycle time may have to be increased. The trend has been to cut back on polishing because of its high cost. moulds are being made that still show cutter marks on the non-visible areas of the parts. While this practice may save money in the construction of the mould, it may increase part costs due to high scrap and down time. The non-polished areas will generate frictional heat in the material as it passes over these areas. This added heat can cause the material to cure prior to filling the part. These unpolished areas can change the filling pattern of the material, which can result in gas being trapped in locations that can not be vented. For these reasons, that it is suggested that all moulding surfaces be polished to a minimum of SPI #2 rating. The mould surfaces to be polished include the cavities and cores, the vents, the gates, the runners, the sprue and the entire parting line. The reason for polishing the parting line is to insure that any flash that may occur on it will come off of the mould with a minimal amount of effort. When polishing a mould, care should be taken to be sure to always polish in the direction of draw. Vents need to be polished in the direction of material flow and they should have the same degree of polish as the cavity and core. Flat surfaces that have no influence on the removal of the part can be polished in any direction. When polishing deep ribs that were cut using the EDM process, it is important to be sure to polish out all of the EDM pit marks. Otherwise, there may be a problem with the rib breaking off of the part and sticking in the mould. After the mould is completely polished, then it is ready to be plated. Please keep in mind that any defect in the steel surface will not be covered by the plating, but will be accentuated by it. While there are a number of different types of plating available, to date, chrome plated moulds provide the best part release and with the best part finish. Because some materials have fillers that are incompatible with nickel, the use of nickel or electrolysis nickel to plate moulding surfaces is discouraged. In addition, nickel plating lacks the wear resistance of chrome plating. The surfaces to be plated should include the cores, the cavities, the core pins, the ends of the ejector pins, the runner blocks, the vents, and the entire parting line. To protect the moulding surfaces and to insure good part release, it is necessary to plate all the surfaces that were polished. After the mould is plated, it will be necessary to repolish the chrome because unpolished chrome plating may cause sticking. Often we find that moulds built to run thermoset materials have little or no support in the middle. This will result is heavy flash around the sprue and parts that vary in thickness from the sprue side to the side opposite. To resolve this problem we suggest installing substantial support pillars down the center of the mould between the parallels (50.8mm (2”) dia. If possible). Sometimes the center of a mould will have heavy flash even with good center support. In these cases it may be necessary to do what we call “Doming the mould” or “High Centering the mould”. This is accomplished by placing a 0.0508mm – 0.0762mm (0.002” or 0.003”) shim on the support pillars in the center of the mould, which will cause the moving side of the mould to be slightly domed. On the stationary side of the mould we suggest using the modified locating ring shown below, that can also be shimmed 0.0508mm – 0.0762mm (0.002” or 0.003”) so this side of the mould can also be domed. Injection-Compression moulds require non tapered side locks and are also necessary for any moulds where maintaining the alignment of the mould halves is critical to meeting the quality requirements of the part. They should be located on all four sides of the mould. The overall design of Progressive Components’ side locks is very good, since they have a longer engagement and are thicker. The clearance between the cavity and core should be 0.0254mm – 0.0508mm (0.001’ – 0.002”) per side. The engagement of the cavity into the core should be 19.050mm (0.750”). The shutoff around each cavity should be 0.0254mm – 0.0508mm (0.001” – 0.002”). The “pancake” thickness should be 0.152mm – 0.203mm (0.006” – 0.008”). A vent should be ground into the plunger directly opposite the sprue. This vent should start out at a depth of 0.127mm (0.005”). There should be a mismatch in radii between the plunger and cavity as shown, so the ejector pins have material to push against. The ejector pins for the “pancake” should be located around the perimeter for better and more complete flash removal. To prevent damaging the parting line around each cavity, landing blocks should be added that have an area equal to the maximum clamp tonnage of the press divided by 5. Because of the close fit of the plunger and cavity, we recommend the use of non-tapered side locks to align the core and cavity. The types of injection machinery available differ basically in the method of heating and preplasticisation of the compounded rubber. The main difference usually arises between vertically oriented machines, which include both ram and screw-ram presses, and horizontally oriented machines, which are of the reciprocating screw type. In the former the mould temperature is maintained by conduction from the heated platens of the press, whereas the heaters are integral with the mould in the latter case. The configuration of moulds for horizontal machines often result in large surface areas for potential convective heat loss and long paths for conductive heat flow from the press platens. The horizontal machine generates its own preplasticising heat by work on the rubber, which is fed into it in strip form, between the screw and the barrel. This heat is governed by a temperature-controlled fluid medium (water, glycol, or oil), which circulates around the barrel and, in larger machines, through the center of the screw. Progression of the rubber up the screw both heats and preplasticises it. The rubber, collected in front of the screw, pushes the screw back until a trip switch is operated, and the preplasticisation phase is completed. Final heating of the stock takes place during passage through a small die into the runner system of the mould. 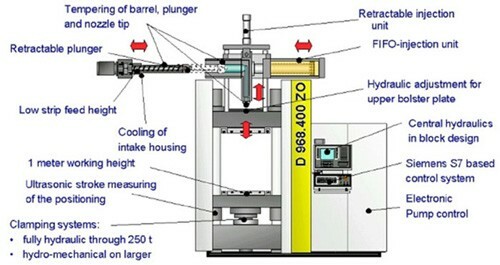 The second type of injection press uses the principle of vertical injection. This type of machine has a separate screw and injection piston in a V-head configuration situated near a vertical upstroking press. The preplasticising screw feeds into the injection chamber through a non-return valve where the compound is injected into the mould. There are many independently adjustable parameters of both the injection head and press unit. 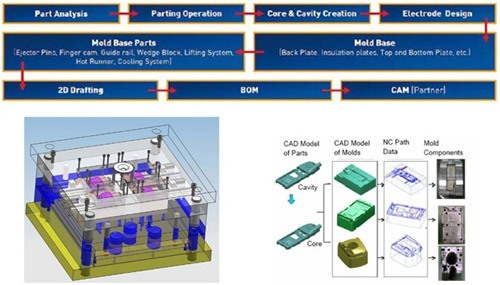 moulds for vertically oriented machines are usually larger in plan area, giving improved conductive heating, and also expose smaller areas for convective heat loss.